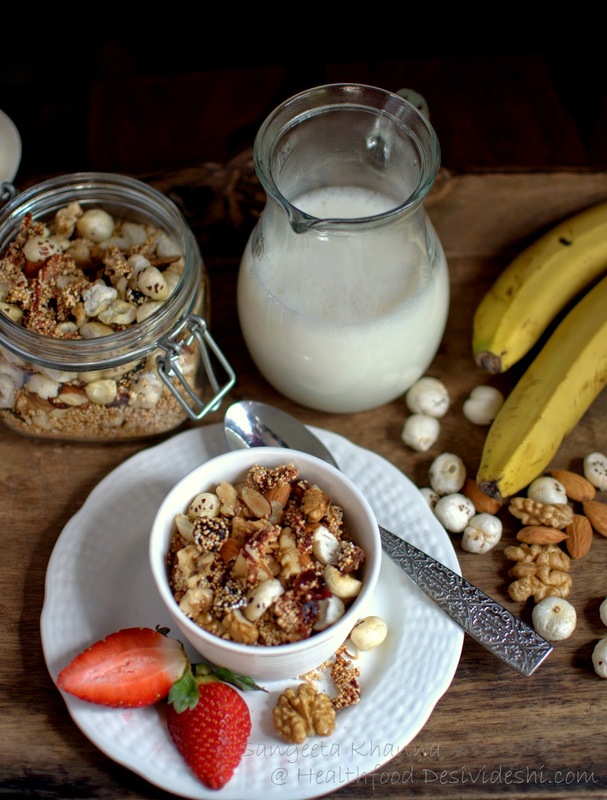 Muesli is a mixture of cereal grains, dehydrated fruits and nuts and we mostly come across oats based muesli in Indian markets. I find them boring but I am no one to judge as I am not too big on breakfast cereals. But some of the desi versions like ramdana (amaranth) and makhana (foxnuts) are absolute favourites and I make both sweet and savoury kind of breakfast cereals with them. This amaranth, foxnut mixed fruits and nuts muesli is one such lightly sweetened gluten free muesli flavoured with fresh strawberries. The savoury is version is coming soon on the blog. We don't realise that we have our own native breakfast cereals that are so healthy we need not have corn flakes or oatmeal. There is so much variety of ready made packaged cereals in the markets and we get them in various flavours ranging from fruits to chocolate to nuts or honey. But most of them contain just a little amount of the real fruit or honey, the flavours are added by synthetic flavoring agents. I wouldn't like eating a synthetically flavoured cereal to start my day ever. If one has to get it packaged, better get unflavoured and add fruits, nuts and sweeteners of one's own choice. But then there are some healthier options too if you know about popped amaranth and foxnuts (makhana). Amaranth is a gluten free high protein grain that has high calcium and other minerals as well. The protein is superior quality and easily digestible too. See more. Fox nuts or gorgon nuts also is a high protein popped nut with loads of vitamins and minerals that are all easily absorbed and metabolized in the body. Both these super foods make the best combination to start the day I say. These can be had as it is with milk and fresh fruit for breakfast, but a bit of natural flavour addition enhances the value immensely. This strawberry, prune, cranberry, raisin and almond walnut combination of flavours works really well with these healthy cereals. And please get rid of the mindset 'if its healthy its not tasty'. This IS a tastier than your regular packaged cereal. I used fresh strawberries since it is the season of strawberries here. You can always use any fruit of your choice. 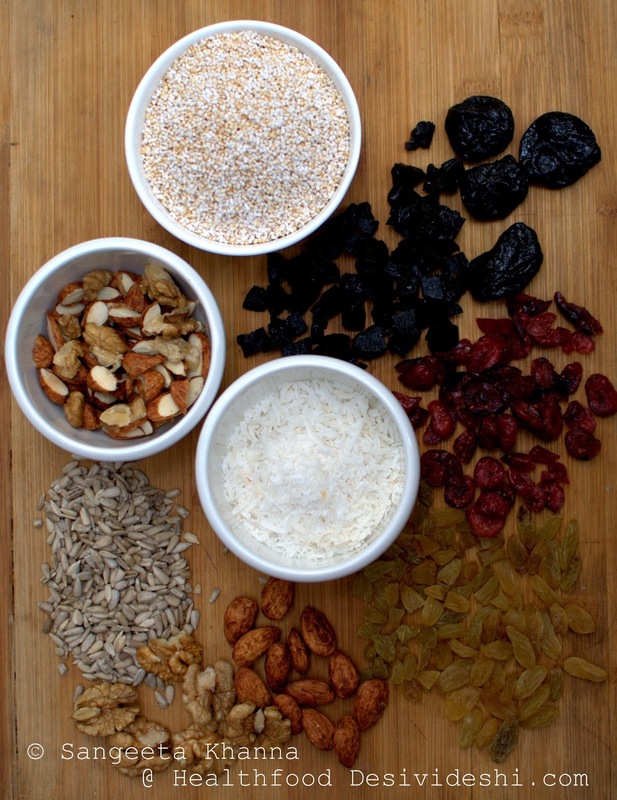 Take care that the fruit is the only sweetener in this muesli along with some flavours of prunes, raisins and craisins (dehydrated cranberries). You can add some chopped dates and figs too if you like. Nuts can also be replaced with anything you like. This recipe would require baking in two batches if your oven is a medium or small size. Get a deep baking tray and mix the popped amaranth, chopped makhana, chopped nuts and sliced strawberries together. The fresh strawberry slices will get stuck with amaranth seeds all over. Put this tray in the preheated oven at 150 C for an hour. 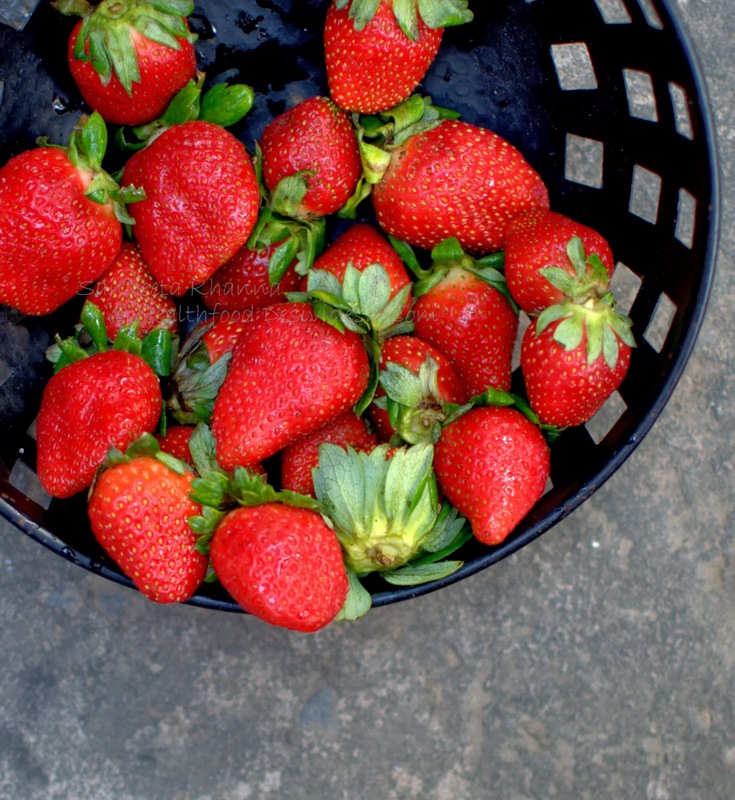 Stir the mixture every 15 minutes and let the strawberries stay coated with popped amaranth grains. The fresh strawberries ooze out the juices and make clumps of popped amaranth and makhana and that is actually a good thing. The flavours come out nicely and get infused in the baking muesli. Keep dispersing the clumps everytime you stir the baking mixture.The strawberries will get completely dehydrated at the end of the baking time. Cool down and then add the dehydrated fruits. Store in airtight jars. Use about 3/4 cup with milk and chopped fruits for breakfast. 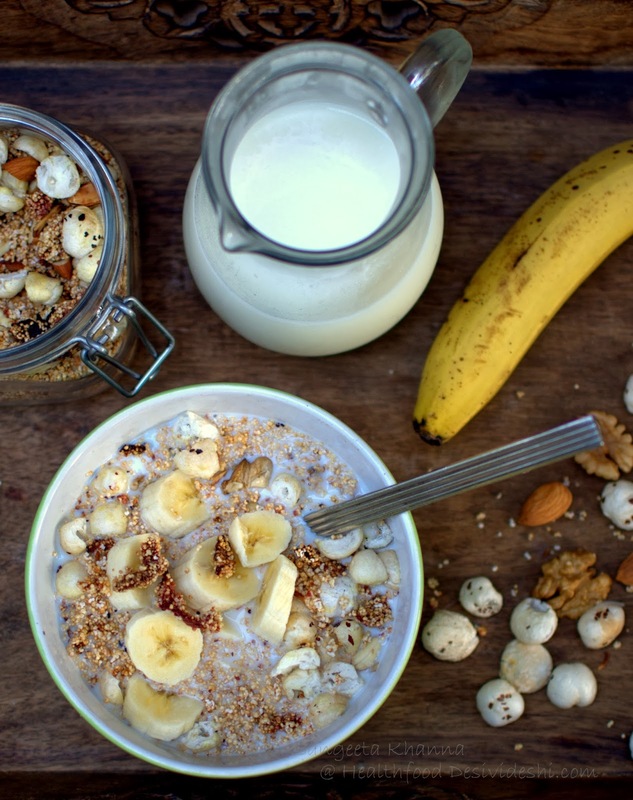 We love bananas in muesli and milk mostly. Mangoes too when in season. Don't worry if you don't have an oven or you don't get strawberries in your part of the world. Just mix some popped amaranth, chopped nuts (preferably roasted but raw is fine too), chopped black raisins, golden raisins, prunes, cranberries etc and store in airtight jars. I add some coconut flakes to this mixture too. 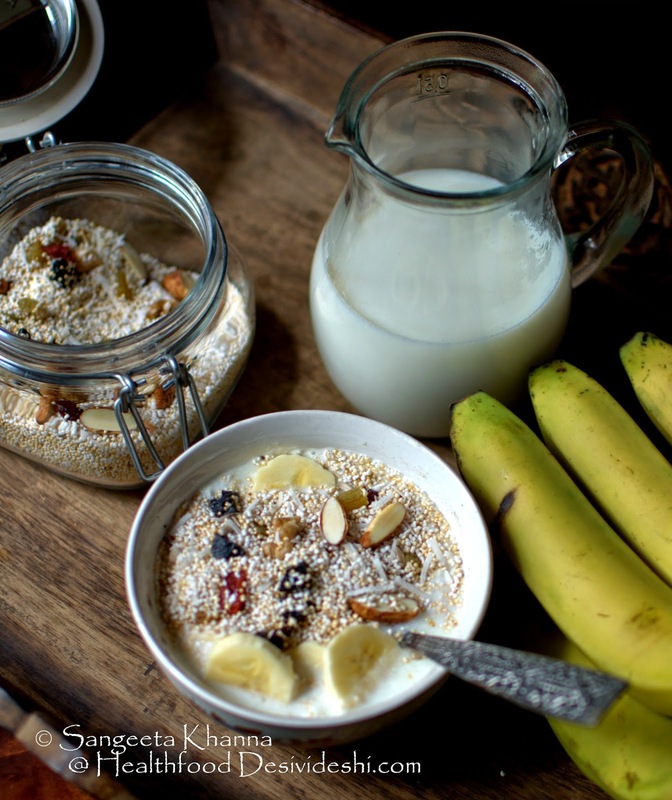 Just add to milk along with sliced bananas and enjoy your instant breakfast. Muesli doesn't need to be flavoured with synthetic flavouring agents. You can enjoy it with natural sweetness of dried fruits and fresh banana added or add a little honey if you find it less sweet for your taste. 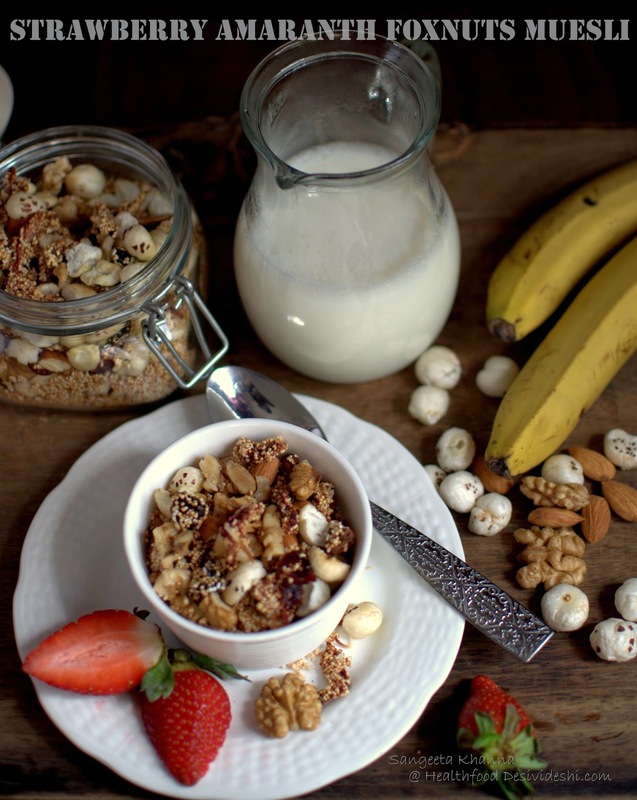 Enjoy breakfast cereals everyday without worrying about additives and high carb-low carb or protein or fat calculation. 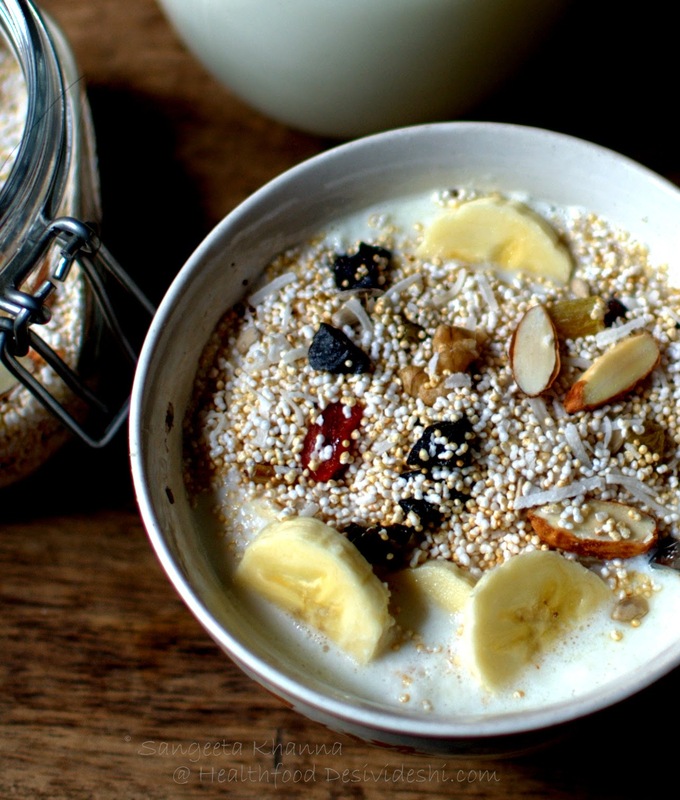 This muesli will take care of everything. All gluten free. That is one filling bowl of breakfast! !! Makes me hungry! !! Awesome pics!! It looks very tempting. The pictures do full justice to the super healthy breakfast option. Again, totally agree with your choice of local ingredients and fresh seasonal produce. This is fantastic. I want to make a muesli for kids. Can I use something else in place of amaranth; I don't get it easily here? I do get makhana. Can I add some honey while serving? Thank you Rachna. You can always use rolled oats or even puffed or popped rice cereal instead of popped amaranth. Hone or fresh fruits can be added while serving too. That's great, Sangeeta! Will try the substitute and let you know. I am sick of using packaged cereal for kids. Do ping me if you post any other muesli recipes :-). where do you get these alternate grains from in delhi? i just dont even get basic stuff like sattu/chawal ka aata, so forget millets! I get most of these things now in my neighborhood too but I have bought these ingredients from Navdanya in the past. Check Dilli haat Navdanya store wheneever you visit and find out more stores across Delhi or look for FabIndia stores too.